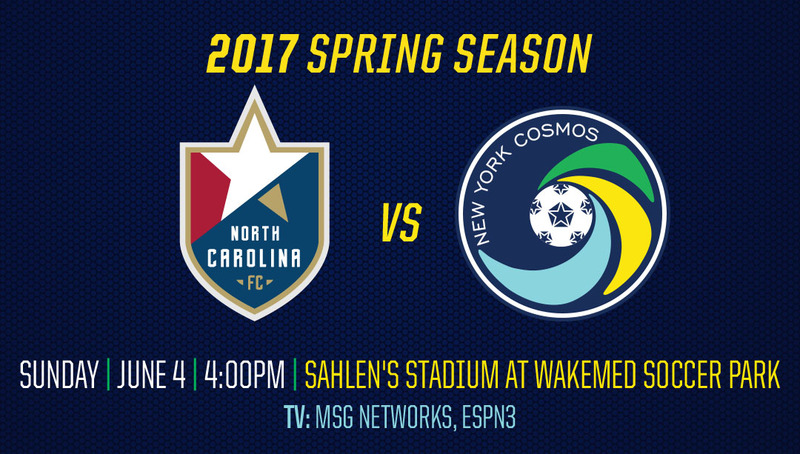 The New York Cosmos (3W-4D-1L) will be on the road against North Carolina FC (4W-2D-3L) on Sunday, June 4. The Cosmos are coming off a scoreless draw at home against the San Francisco Deltas, a result that extended New York's unbeaten run in the 2017 NASL Spring Season to six games. Midfielder, Emmanuel Ledesma, earned his second Emirates Man of the Match honors this season after another strong performance. Ledesma completed 17 of his 23 passes, creating two chances for his teammates. Away games have been the Cosmos' forte since last year – the team has not lost on the road for eight games. New York began their undefeated road record with a 2-0 win over North Carolina on September 29, 2016. North Carolina prepares to host New York after a 2-1 loss to Jacksonville Armada FC. The Cosmos should keep an eye on midfielder, Tiyi Shipalane, whose goal from distance against the Armada was named the NASL Play of the Week. Another player to watch is midfielder, Lance Laing, who leads the NASL in total crosses (55), is tied for the league lead in assists (3), and tied for second in the NASL in goals (4). Laing is the only player in the league with multiple goals from outside the box, netting in two. The Cosmos have a 6-1-4 (W-D-L) record against North Carolina FC. New York has not lost in the last six meetings between the teams, emerging victorious in five of the games and outscoring North Carolina 15-4. New York is on an eight-game unbeaten run (5W-3D) that began with a 2-0 win over North Carolina FC on September 29, 2016. Cosmos midfielder, Andrés Flores, has been a powerhouse against NCFC, tallying three goals and four assists in the last five games between the teams. Goalkeeper, Jimmy Maurer, has kept three clean sheets this season, tied for second in the NASL with Miami's Daniel Vega. Maurer had a shutout in the Cosmos' last meeting with North Carolina. Defender, Carlos Mendes, was named to the NASL Team of the Week for Week 10. He won five duels and made two clearances, while distributing the ball with a passing accuracy of 88%. The Captain's efforts helped New York earn their fourth clean sheet of the season.